Embark on an amazing 8-day journey through the vast, pristine wilderness of Patagonia – one of Chile’s most beautiful landscapes. 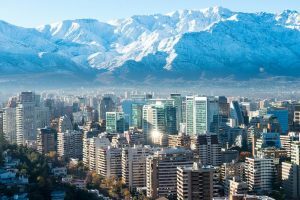 Your adventure kicks off in the capital city of Santiago, a modern, sprawling and vibrant metropolis that is flanked on each side by the Andes and coastal mountain ranges. It is here that you can enjoy a series of tours that range from historical and cultural explorations to specialized excursions focused on food, architecture and art. After exploring the vibrancy of Santiago, you will head to the awe-inspiring beauty of Patagonia. Over 500 years after the arrival of the first European seafarers in Patagonia, the words to describe it are the same: exotic, faraway, vast, infinitely beautiful, wild, and indomitable. Situated in the heart of the National Park, the Torres del Paine Mountains are one of the main attractions of the region and an icon of Chilean Patagonia. 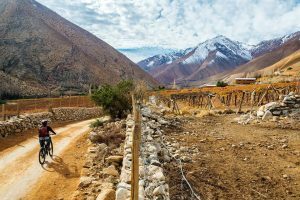 The immensity of the ice floes, the majesty of the mountains and the expanse of the lakes are a constant source of wonderment – undeniably a photographer’s and nature lover’s dream destination. Lastly, end your incredible tour with a fantastic wine tasting experience in Casablanca, which sits just outside of Santiago. Enjoy a guided tour around the Veramonte Vineyard, sample some of its finest wines and learn more about the estate’s wine-making process. A close encounter with the wildlife of Patagonia – with the opportunity to encounter pumas, condors, southern deer, guanacos, foxes and rheas or ñandues (to name a few) during your journey. Wine tour and tasting, accompanied by a local resident guide, in Santiago. Itinerary based on a minimum of 4 and 2 guests. Rates do not apply over Christmas and New Year dates. The rates quoted are subject to change without warning if there are any increases in Chile. 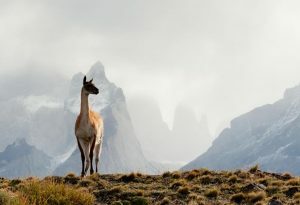 A male guanaco stands guard on a mountain pass in Chile’s Torres del Paine National Park.